This week, ATS members and patient advocates from across the U.S. traveled to Washington, DC to advocate for respiratory health during ATS Hill Day 2016. ATS members and patient advocates from Alabama, Arizona, California, Florida, Hawaii, Illinois, Louisiana, Michigan, Mississippi, New York, New Jersey, Pennsylvania, Tennessee, and Washington state participated. Legislation to research, treat, and prevent respiratory conditions among veterans exposed to burn pits. Council of Chapter Representatives Chair Steve Kirtland, M.D., said, "I have participated in ATS Hill Day for several years now and appreciate the opportunity to partner with our patient groups and communicate directly with our members of Congress about the need to increase research funding, TB funding and effectively regulate tobacco. The ATS Hill Day provides this unique opportunity to build relationships with our legislators and advance lung health." 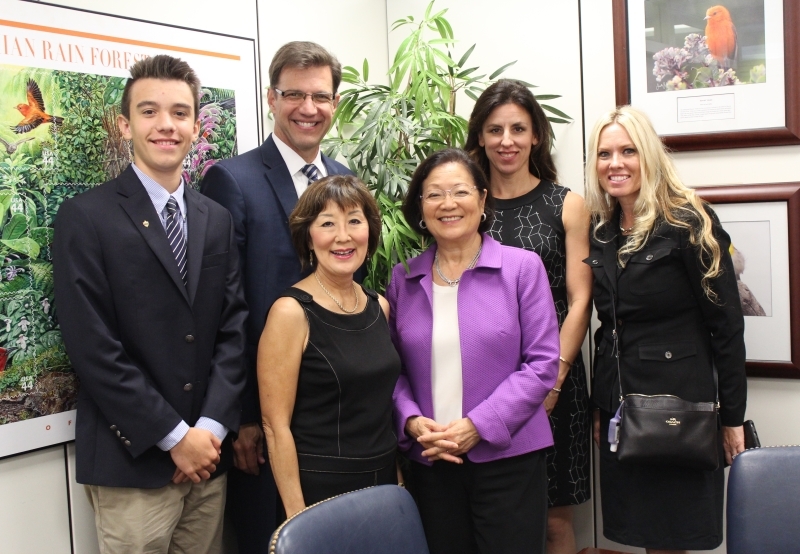 Left to right Bennet Blackwell, Tim Blackwell, Chis Fukui, Sen. Hirono (D-HI), Allyn Harris, Teresa Barnes.